It's a bit like a shop hop, but there are no fees and no cards to stamp. Simply visit any participating quilt shop during the summer and ask for their free row pattern. 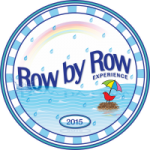 Each shop is participating in the Row by Row Experience in their own way. You will be able to buy kits for the rows you love and many are carrying the FabricPlates from Zebra Patterns. InterQuilten's Kits and patterns will be available for purchase, and can be mailed, beginning November 1st. We recommend calling in October to reserve the patters and kits you would like mailed after November 1st. The 2015 theme is Row by Row H20., and each shop has worked the water theme into their row. You can check a shop's website, as many will post it there. Also, each area has a Facebook page where photos of the rows will be posted for the shops in that area, and you can see the quilts being turned in. That's a big no-no! The patterns are copyright property of the designers. Click Here for a printable list of Michigan shops, with pictures of their rows. With the Row by Row Experience you can win a prize for sewing! Complete a quilt using at least 8 different rows from 8 different 2015 participating shops. Be the first to bring it into a shop and you win a stash of 25 fat quarters. (That's 6-1/4 yards of fabric!) Win a bonus prize for using that store's row in your quilt. To be eligible, a quilt must be quilted, bound, and labeled. 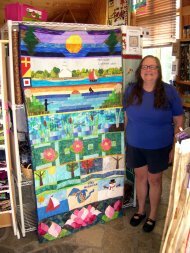 The winning 2015 Row By Row Quilt turned in at InterQuilten. You decide. Stack your rows, arrange around a center medallion, make them horizontal, vertical, upside down, on the front, on the back, whatever! You are the designer. Be creative and have fun, but be sure to use 8 different 2015 rows from 8 different 2015 shops. Can I win at more than one shop?